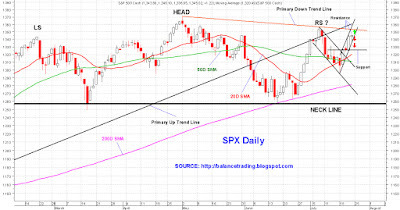 The sharp rally in indices since last Tuesday did little to move the breadth indicators. New highs shrunk for NYSE and Nasdaq as indices went higher and technical divergences abound in daily and weekly charts for all indices. The pattern is consistent with a developing top. 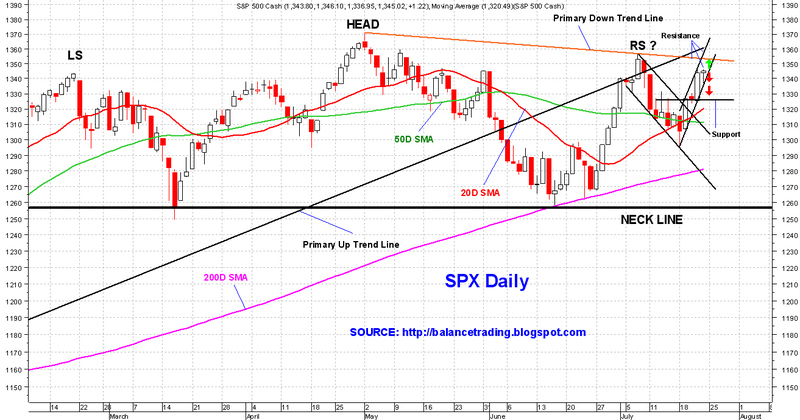 So long as SPX is trading below the primary down trend line (orange), there is no reason to be long in this market. Indices would bleed lower as long as there is no resolution to the debt ceiling crisis. And even once a compromised and very likely idiotic agreement is reached, the chance of indices selling off is substantially higher than rallying.